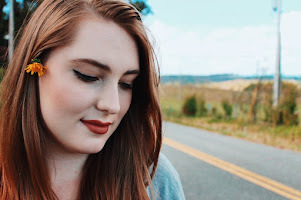 a christmas wrap up. - crafted fragments. happy holidays to all, & a very, merry christmas! i absolutely cannot believe that christmas has just come & gone... december just flew by in the blink of an eye for me! 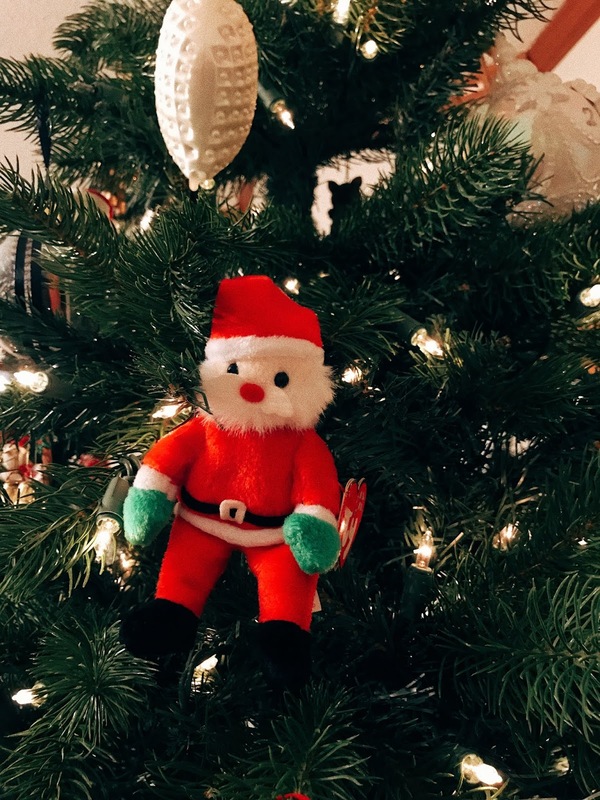 & so, in the light of being a total nostalgic, i wanted to write a post to reflect on all we did this month, & all of the holiday traditions of this christmas season. i know everyone celebrates differently, but these are a few of the ways myself & my love bug hubs, kevin, like to celebrate! 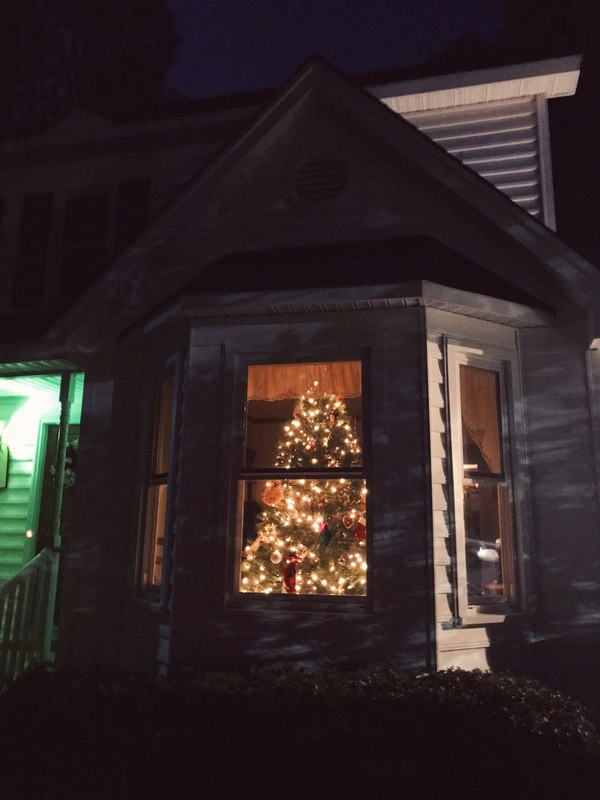 this year, our first order of business was setting up kevin's family christmas tree! it was my first time being included in this family tradition (as a new member of the family "in-law"), so i felt truly honored. we blasted all the best classic christmas music & broke into the boxes & boxes of family ornaments. i have to say, i love their christmas tree. it is so full of history. 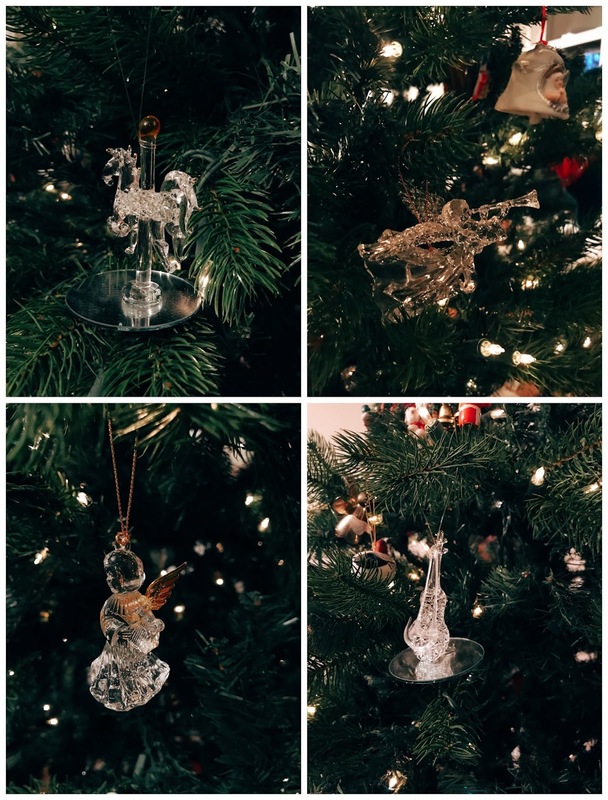 their ornaments range from gifts, to handmade crafts from the grandkids, to old photos of kevin as a baby (so cute), to the most elegant glass ornaments. i'm so in love with the story the tree tells. i truly hope that some day, i have a tree that tells such a magnificent story of family & love. i mean, was this window not just made for a christmas tree? 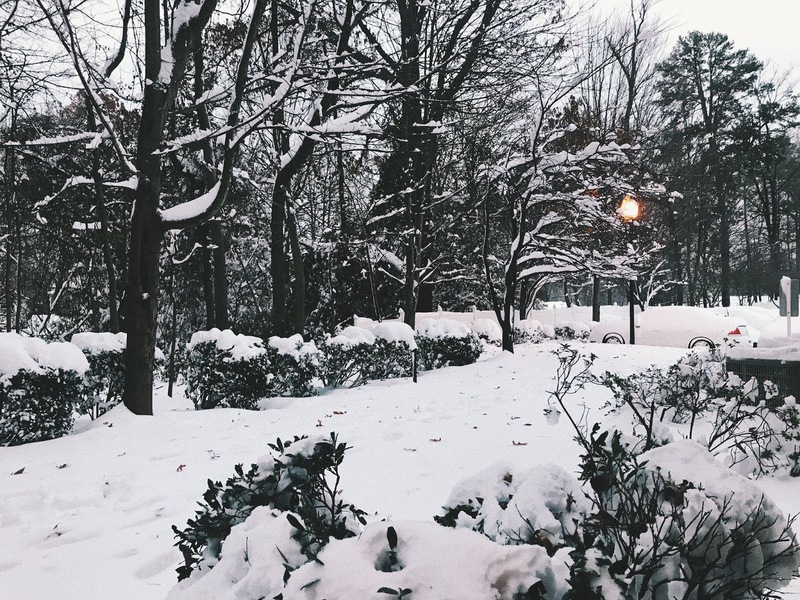 now, this month we were blessed with a wonderful few snow days! usually, i'm not a huge fan of the snow... i'm a california baby, what can i say? snow looks pretty & everything, but if you have to get out in it, people drive like crazy, you're constantly soggy, & the air hurts. but, this month it snowed so much that we were forced to stay inside... so how could i hate it? it was the perfect opportunity for cuddles & christmas movies. speaking of which... let's talk favorite holiday films, my favorite subject of all. in first place, always & forever, love actually. i don't know about you, but i can't even get through the first 10 seconds before i start crying (& then consequently weep through the rest of the movie). yes, it is chock full of the most inappropriate british humor, & no, you should never watch it with your mom in the room. but, it is also the most heart-warming & heart-wrenching story about humanity. & how messed up we can be. & how wonderful we can be. & how love actually, is. DUH. ugh, it's the best. & last, but in no way least, the christmas royalty that is elf & the grinch. these two movies equally have my heart. 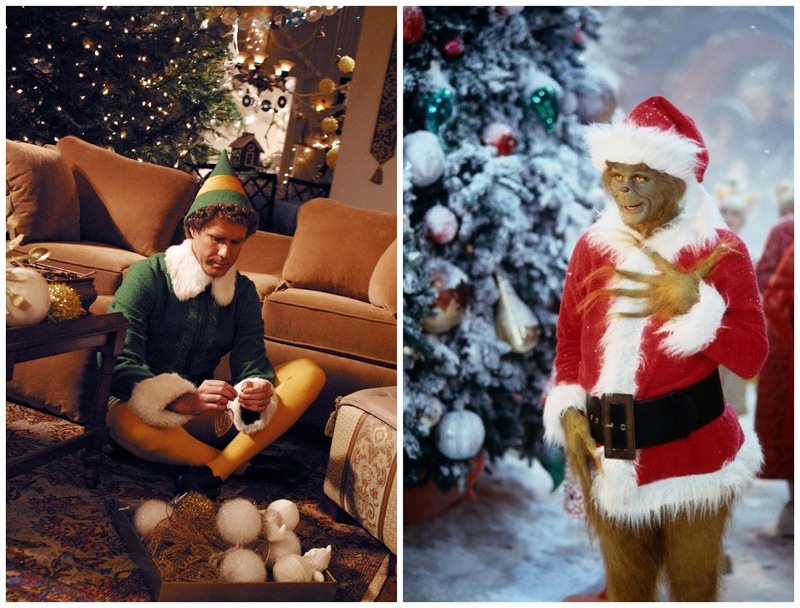 they are the best christmas films to cheer you up, make you laugh, & get you straight into the christmas spirit. now the grinch is a massey family favorite. my mother makes watching this movie the most fun, as she literally loses it at every line. she also frequently uses the term, kiss it whoville, during the holiday season, which is just one of my favorite things ever. it broke my heart to watch the grinch without my family this year. it's been my first holiday season without them, & wow. 3000 miles between yourself & the people you love is not something i would recommend. i'm so thankful to have my hubby close by to comfort me. he was very patient with me as i paused the movie a thousand times to say, "this is my mom's favorite part!" or "my mom would be peeing herself at this line" or "i'm gonna call my mom & tell her we're watching it & then face-time her so she can watch it with us"... he's the best for adopting the massey family traditions with such ease & grace. thanks, babe. elf is another classic that just can't be beat. i know every line by heart. & i frequently scream, "SANTA! I KNOW HIM!!" throughout the holidays, just to weed out the good people who know my references. 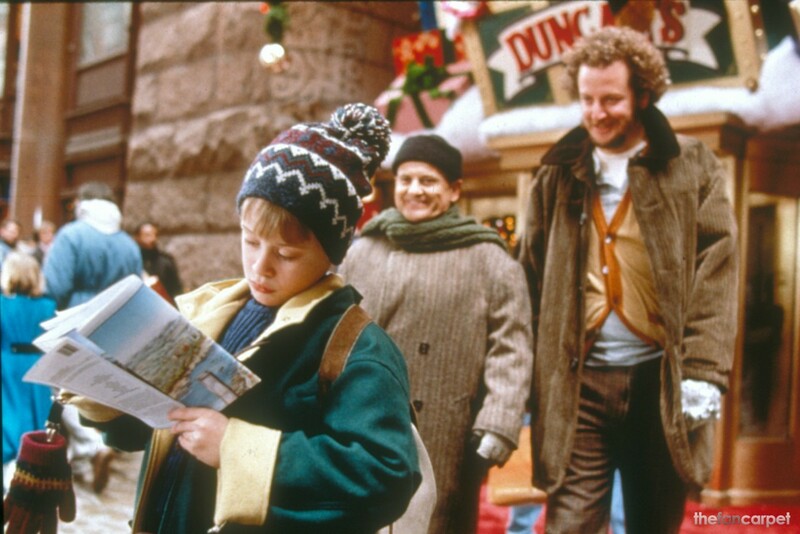 i think it's the perfect movie, combining the best kind of humor with the best kind of childlike christmas spirit. also the burping scene is probably 90% of why i like this movie. it has a wonderful soundtrack that i love listening to this time of year. & even though it's totally gross, i'm slightly intrigued to know what elf spaghetti tastes like... do i risk becoming violently ill just for curiosity's sake? i mean there's no way pasta & syrup & poptarts taste good together... right? (here's the recipe if you're brave). honorable mention? 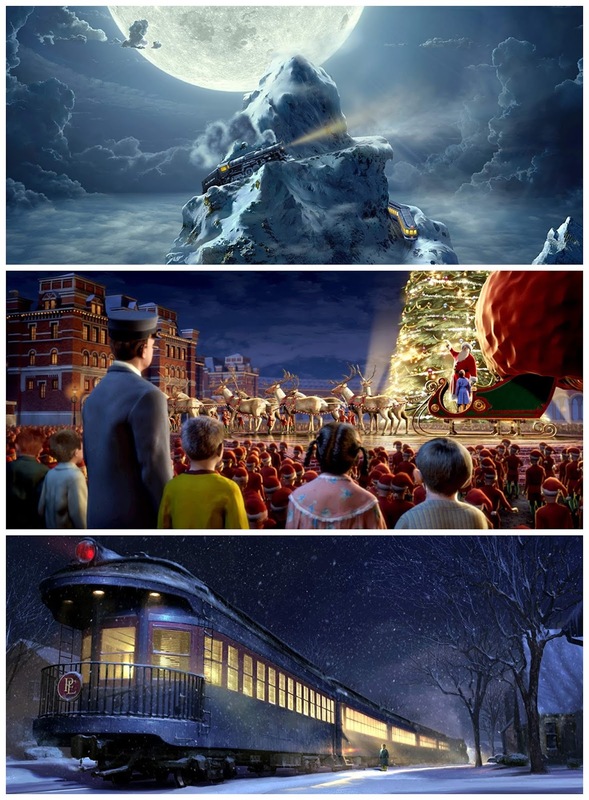 polar express. 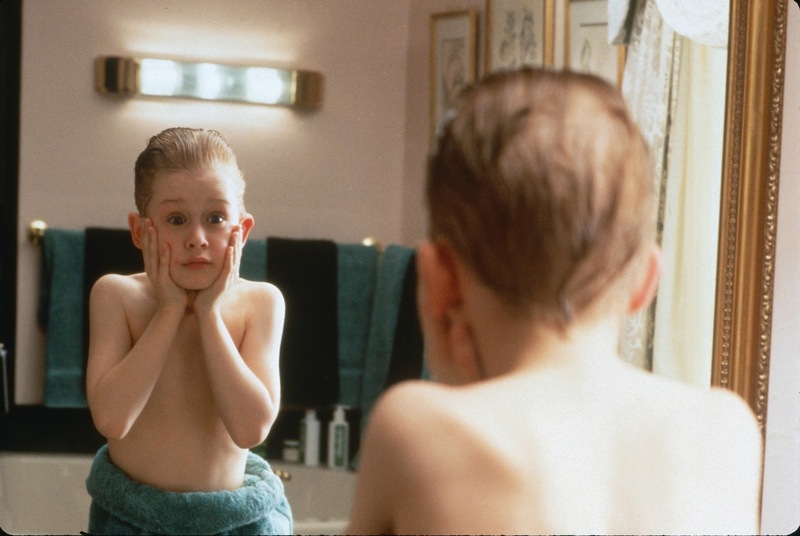 it's probably my favorite "kid's" christmas movie out there. i have such a vivid memory of the first time i watched it. because i loved the book growing up, it was like pure magic seeing the illustrations i grew up loving coming to life on the screen. & plus, the soundtrack. dude. hot chocolate is my jam, as is the polar express AND of course, josh groban's believe. also i know i can't be the only one that tears up when the kids sing when christmas comes to town. ugh, i love this movie. it's the perfect excuse to get in your christmas pjs & cozy up with a cup of hot chocolate with your loved ones. another one of our favorite traditions every year is to drive through a particular neighborhood in our town that puts on an amazing light display. this photo does not do it justice... but trust me, it's the coolest. it's a very old neighborhood, so there are giant trees everywhere. & in the trees are hung hundreds of colored christmas orb lights. they're so beautiful. our usual ritual is to firstly go to starbucks:: he gets peppermint hot chocolate, i get a caramel brûlée latte, & we share whatever christmas baked goodies they have that day. this year we tried the gingerbread! then we roll our windows down, turn up the heat, & blast classic christmas music as we drive through the neighborhood. it almost brings me to tears every single year. it is pure magic. now, i know this is a touchy topic that usually divides people... egg nog. incredible or disgusting? personally, i'm obsessed with egg nog. it's a delicacy. i wait all year for the moment i see egg nog on the shelves. & i savor every moment i get with my beloved egg nog before it's gone for another year... ahh, the sweet deliciousness. i converted my husband into a egg nog lover this year. we tried southern comfort's vanilla spice egg nog (we don't spike it) & it was to dieeeee for. do yourself a favor, hop on the egg nog train, & try a sip! how utterly indulgent am i, drinking egg nog & baking christmas goodies... i should be ashamed. i'm not, but i should be. we had a bunch of leftover baking supplies, & we were craving brownies, so i embarked on a brownie adventure! i confess, we did consume a good amount of brownie batter in the making of this... but what is life for if you can't lick the spoon? i know it looks ridiculous & not at all appetizing. but they actually tasted pretty good! on one side i used some leftover icing, & a handful of candy canes that collected in our kitchen over the month, crushed up. on the other side i used leftover chocolate & toffee bits, with the last of the salted caramel sauce i had sitting in the fridge. we sat down to watch love actually with our egg nog & our brownies, & we cuddled into a sugar coma of total bliss. they may not look pretty, but our stomachs sure appreciated them. 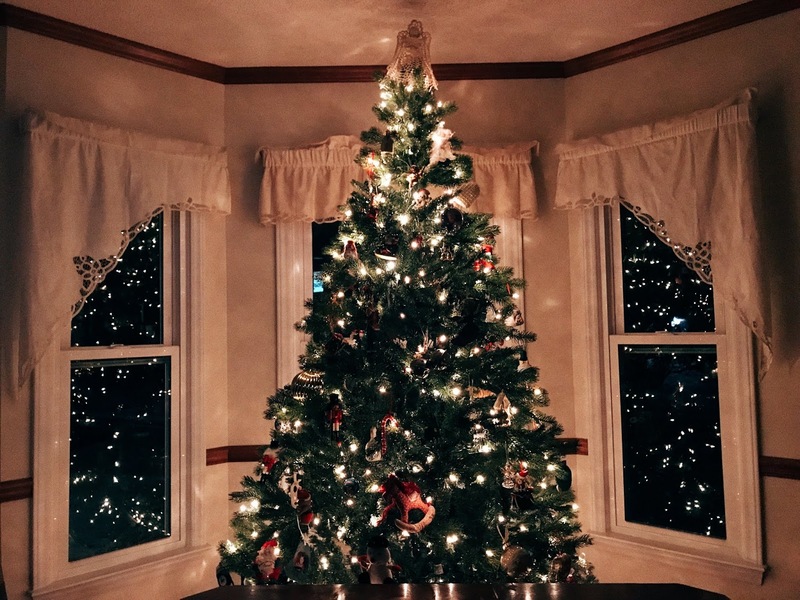 now, i can't write a post about christmas traditions without showing you our tree! disclaimer: we're poor haha. we bought this little tree in college, & it's served us well. you could say... though she be but little, she is fierce ;) someday we hope to have a real big tree full of ornaments, & save this little guy for all our disney ornaments. but for now, say hi to our baby tree! ain't she so pretty, though? as you can probably tell, i really love the rustic, cozy vibe for our tree. & as i've said before, i absolutely love ornaments. i'm pretty sure christmas ornaments are one of my favorite things in existence. they are just so cute & i can't get enough. i get 99% of my ornaments from target, & usually buy them after christmas because they mark them 50% off & it's such a steal. 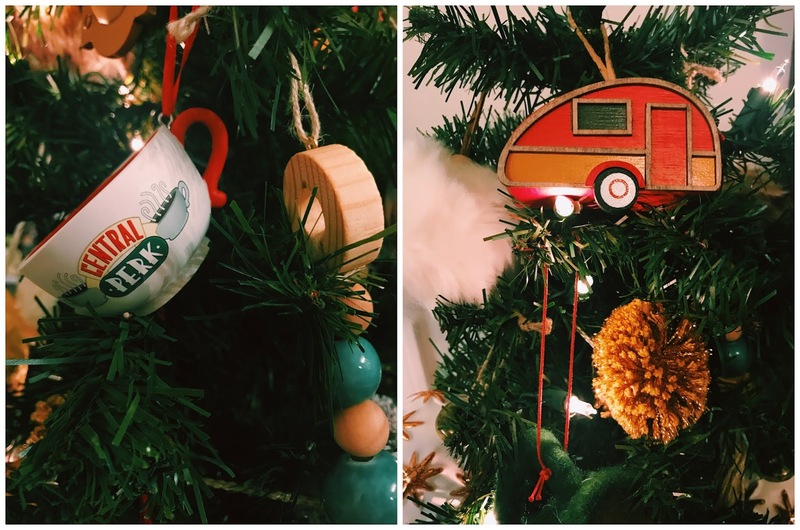 i think we're gonna have to upgrade to a bigger tree next year, because i totally raided target the other day & bought even more rustic & cozy ornaments to match the ones we have! 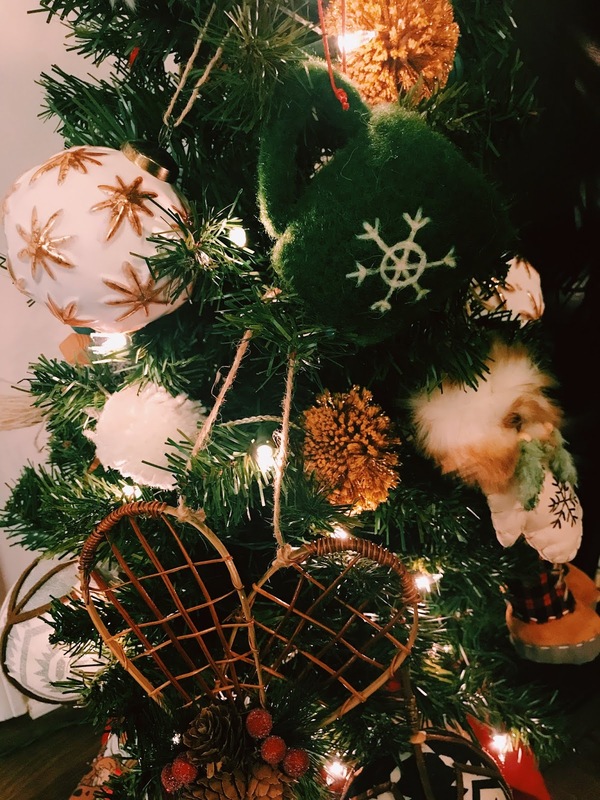 the little snow shoe ornaments absolutely kill me, & i love the white ones with the gold stars. they have such a vintage look to them & i adore that aesthetic. i bought the felt hot chocolate mug for kevin a couple christmases ago, because he loves his hot cocoa. plus you gotta love the puff ball garland i have around our tree. it just adds so much cuteness! now as i've previously mentioned, i'm a huge disney lover. so the dream really is to have a christmas tree full of just the sketchbook disney ornaments. the sketchbook disney ornament collection is truly the most beautiful collection in existence. i'm not joking when i say i want every single one. 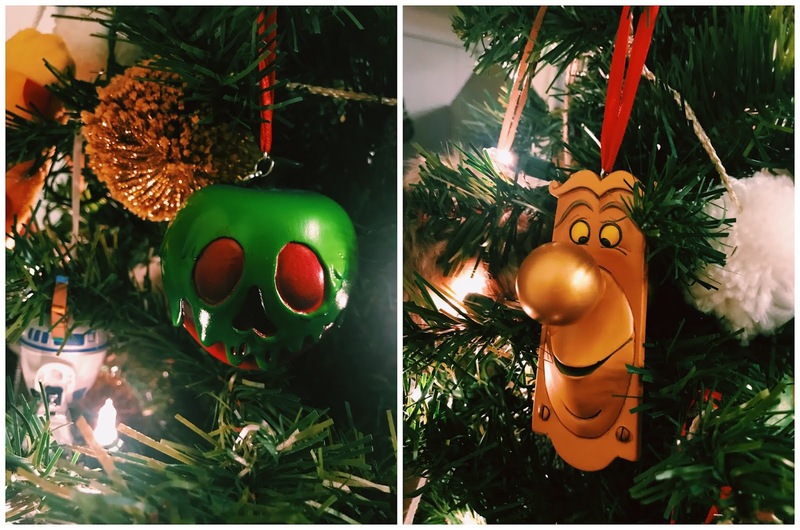 & i'm not joking when i say my life goal is to eventually collect them all & have a disney christmas tree. it would be so amazing!!! for now, we've collected the stunning snow white's poison apple, & the adorable (heh get it) door nob from my #1 favorite disney film, alice in wonderland. i definitely have my eye on so many others... there's beauty & the beast, chip & dale, cinderella, mickey & minnie... the options are endless, & some day i will collect them all! 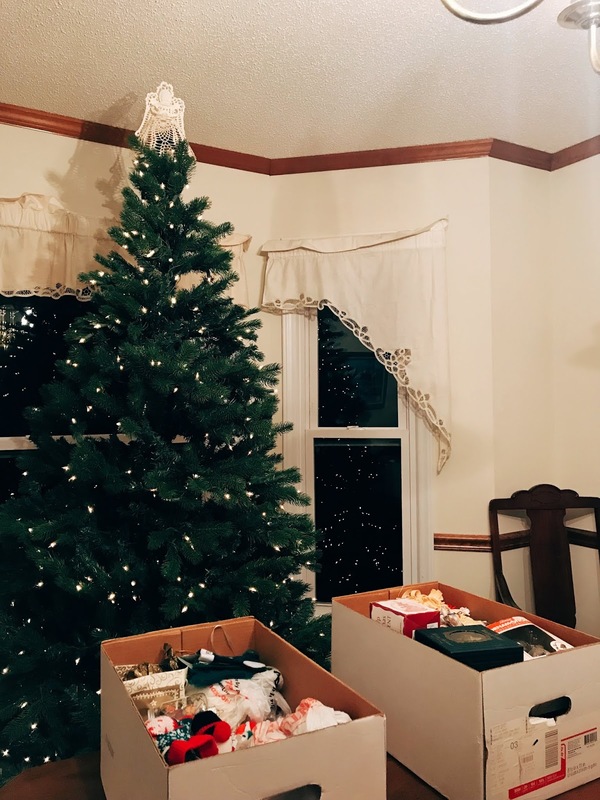 once we finished putting up our little tree with all our collection of ornaments, it was time to start wrapping presents! we didn't have a lot of spending money this year, but christmas isn't about the presents. it's more about the giving spirit. my personal love language, or my way of showing others i care, is usually through gifts. i just love picking out special little things for my friends & family. i think the important thing about giving is that it doesn't matter how big the gift is, but rather, how thoughtful the gift is. that's what makes christmas special. wrapping christmas presents, by the way, is my favorite thing in the world. i have an extensive wrapping paper collection which i'm super proud of, & the hardest decision of each year is picking which ones to use! i love all things crafty, & wrapping presents just gives my creative soul such joy. kevin doesn't love wrapping quite as much... he gets frustrated with the tearing & the folding & the taping. which i think is pretty standard. but look how cute his presents were! (the santa wrapping paper & the marble wrapping paper). i was so impressed!! thanks for dealing with double sticky tape just for me, babe. we made the road trip back to kevin's parent's home for christmas, which was super sweet. they have the best christmas decor, passed down from generation to generation, all filled with magnificent stories. we ate good food, spent time with our precious niece, watched elf together with kevin's parents for their first time, & opened presents! all in all, it was a great christmas & a great time spent with my new family. we waited til we got home christmas day to open our presents from one another. we've been working on our DVD collection ever since we moved into our first home together, so this year we both picked out movies for each other! he bought me my two favorite movies of all time, la la land, & the greatest showman. i am so excited to own them. when la la land was in theaters, i saw it four times. it changed my life. & the greatest showman is my jam. i've been blasting that soundtrack all year long, & now i can watch it whenever i want (plus there is a singalong version in the bonus features, ayyoooo) & i'm thrilled. thank you darling!!!! i got him the avatar: the last airbender complete DVD series, which thankfully he was pretty thrilled about! he's always talked about how much he loved it growing up & wished i could see it too, since i didn't grow up watching it. kevin & i were raised pretty differently in a lot of ways, so our whole relationship has been a wonderful time of showing our geekiness to each other. we've already started watching the series together & i love it so far! it's super cute. 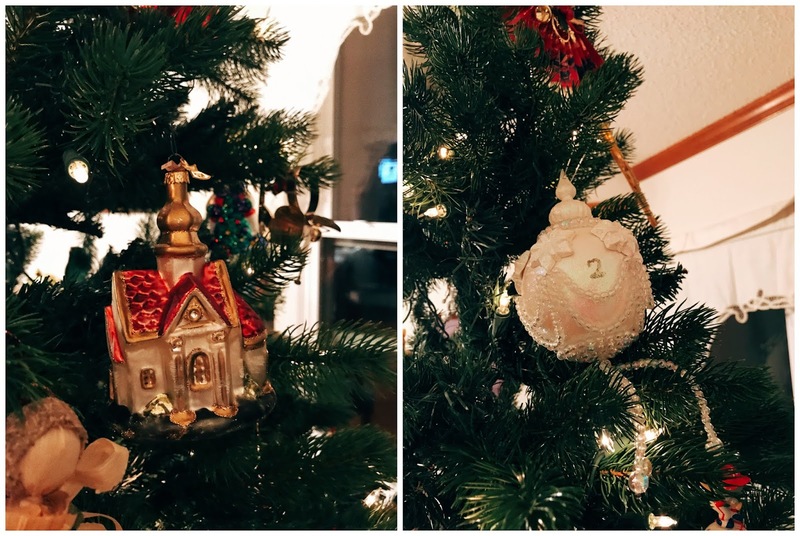 an ornament to celebrate our very first christmas as mr. & mrs.